Hey All, I had an issue with a pump we were using to transfer and recirculate alcohol at 99%. The pump started to rust after a few days and ruined a lot of product. Does anyone have any good suggestions for pumps rated for High Proof Alcohol that are explosion proof and food grade. I would like to get around 50gpm. Thanks. We are graco pump distributors. Give us a call at 417-778-6100 and we can help you. or you can email us paul@distillery-equipment.com. Rust, eh? What kind of pump was it? What material was it made from? We sell a line of groundable AODD pumps specifically for distilleries: SimpleSpirits Pumps. These are air diaphragm pumps, so they require the use of an air compressor to function. 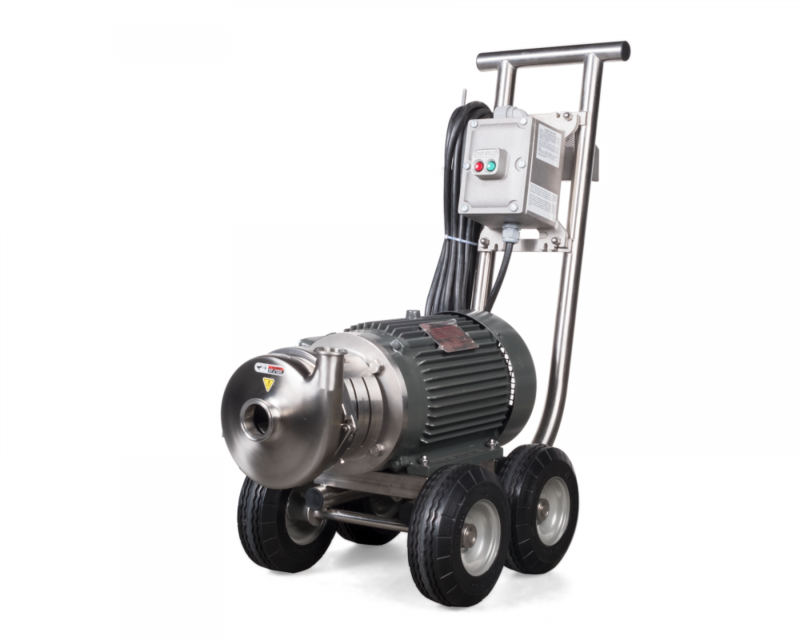 The very rough rule of thumb with air diaphragm pumps is that you want your compressor to be capable of generating your desired flow rate in GPM x .75. So, if you want to pump 50 GPM, you need an air compressor capable of generating about 38 CFM at your desired PSI. Alternatively you can get electric pumps with XP-rated components like this, but these get pricey very quickly. An observation, where do you get 99% alcohol from? 95.6% is as high as can be distilled at atmospheric pressure. I would have thought at 99% there would be no free water and no rusting. Many big industrial continuous stills are built from steel and I assume they don't rust. You should be able to carbon filter the rust from your "ruined product", but I am no expert on carbon filtering. We use several Wilden pneumatic diaphragm pumps for spirit transfers and process. The pumps come in a variety of different materials for both the housing and the diaphragms. As our 25 plate column still has been split in two (ceiling constraint) we use one pump to move hot GNS from the bottom of one column to the top of the other. We use another process after it is distilled to remove the remaining water. It was actually 99.6%. I cant elaborate further due to a non disclosure agreement. We still have the 250 gallon with the rust that we will filter and re distill and then charcoal filter to be safe. We were using an AMT 285E-X5 which the guy swore it was food grade and all stainless steel. We should have done some more home work. https://www.cpesystems.com/products/high-proof-alcohol-variable-speed-portable-pump has any one hade any experiences with this type? We use several Sand Piper pumps, SS with teflon plates. Datasheet for that pump says cast iron casing. Hope to have more details up on our website shortly, but give me a holler if you have any questions in the meantime: 707-963-9681.
what are the requirements for an electric high spirits pump in the US? I notice most distilleries use diaphragm. I trained at a distillery in Virginia that used and electric pump for high spirits and it looked no different then their wort moving pump. I see them the electric ones for sale from china but why are more not using them? Read up on Hazardous Location classification, if you haven't. Class I is most relevant to distilleries. Class I gets subdivided into divisions and zones. These divisions and zones say how often flammable vapors may be present, under what circumstances (normal use, equipment breakdown, etc. ), and the zones that have the greatest concentration. So, once you have the classification you can purchase equipment that adheres to those classifications. Or, if you just want the absolute safest, you can go with Class I, Div 1 electrical equipment. Class I, Div 1 motors and enclosures are used in places like oil refineries or chemical processing plants where flammable vapor are present in sufficient quantities to represent a significant sparking hazard pretty much all the time. Of course, this equipment is also the most expensive because requirements to meet Class I, Div 1 are really stringent. A pump that might normally cost a few thousand dollars all of a sudden can top $15k if it's fully kitted out with a continuously purged enclosure, continuous fan cooling, thick-walled stainless bolted enclosure, etc. Air diaphragm pumps can sidestep the need to worry about Hazloc classification, but they can also present their own hazards unless specced properly. I see people assuming that all air diaphragm pumps are intrinsically safe because they don't use electricity. This is not completely true. Air diaphragm pumps could pose a sparking risk because they produce static electricity through normal usage. This is why we offer groundable air diaphragm pumps for distilleries. The mechanisms in the pump that normally build up static electricity can be discharged through the ground. Anyway, this just scratches the surface. I read in a recent ADI newsletter some advice from distillery architect Scott Moore, which I uploaded here. He recommends Class I, Div 2 electrical equipment in a classified area, particularly if proper ventilation is not available. But, as you can see from his "electric sombrero of death" illustration, it's a pretty nuanced subject. Just a reminder, your mobile phone is not approved for use in classified areas, nor is your laptop or tablet. Some laptops and tablet are, but they are rare and expensive. Also to note, most forklifts are not rated for we do nor are standard electrical outlets and lighting. But back to the pumps, TCW has been great to work with, lots of options and usually easy to get. Another recommendation is to get 1 size bigger than you think. simply doing some research on pumps and came across this. If one is working with lower proof alcohol, is this as much of a concern? In visiting, spending a day at a distillery in central WI, I didn't notice ANY level of worry with regards to electricity, phones, lighting.